The txtr beagle is getting a lot of attention lately as supposedly being the world's smallest ereader, even though it isn't a real ereader, but that no longer matters now that I have my hands on an even smaller device. Meet the Trekstor Pyrus Mini. There are no English language reviews of this ereader yet, so I am going to post a rare first impressions post in order to give my readers at least some info. Update: Rather than write a separate review, I'm adding more detail to this post. This beauty is shorter, narrower, and thinner than the beagle, and it weighs in at only 111 grams, beating the txtr beagle by 17g and the K4 by 59g. The Pyrus Mini is being sold by trekstor, and it has a 4.3" E-ink screen, 1.6GB of accessible storage, and a microSD card slot. Yes, this ereader has a screen smaller than on a lot of smartphones. But what's even better is that it has the same screen resolution as on the Kindle and the txtr beagle, and that lets the Pyrus Mini pack the pixels tighter than even the Kindle Paperwhite, Kobo Glo, and other 6" ereaders ( 232 ppi vs 212 ppi). It's missing certain features like the Wifi, and that means you'll need to transfer ebooks over a USB cable. 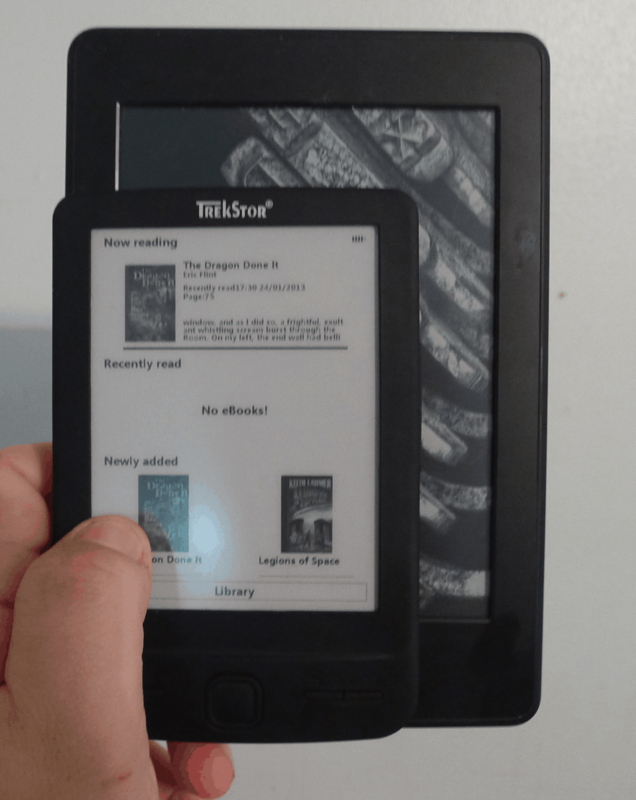 But on the upside this ereader differs from the txtr beagle in that it supports several ebook formats, including Epub, PDF, FB2, PDB, and it can also display text files as well as jpg, gif, png, and bmp image files. The txtr beagle, on the other hand, cannot display ebooks at all. That device is more of an image viewer and actually displays page images. It's also limited to only carrying 5 books at a time, far less than the thousand or more that can fit into the Pyrus Mini. I got my unit earlier this week. This review unit was given to me by Trekstor, and it replaces the two I bought but were subsequently lost by DHL. I've been reading on it for the past few days and I like it. It's a pleasant little ereader that is designed to be gripped in one hand. It has page turn buttons on the right edge, so I suspect it is really intended to be used in your left hand with your left forefinger over the buttons. But I could also use it right-handed. 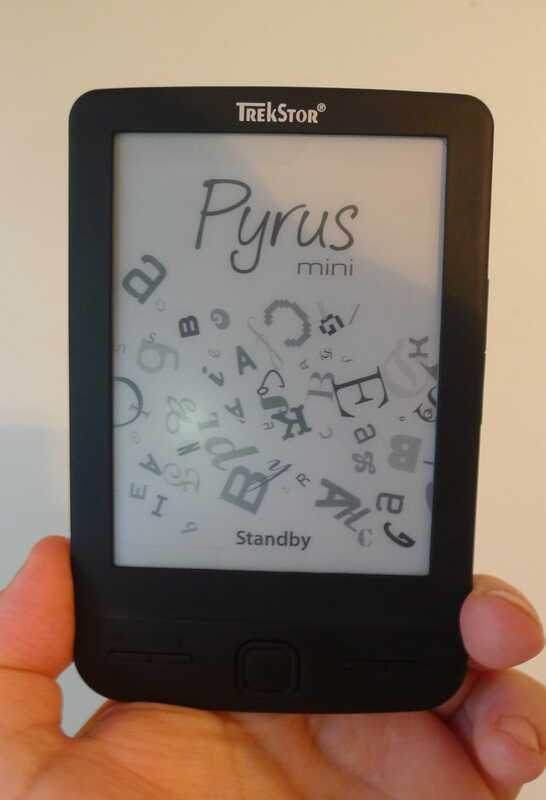 The Pyrus Mini is a budget ereader, and you can tell that by the limited number of features. You're limited to 6 font sizes, 3 margin options, and you can also change the character encoding (this enables support for other language/ font sets like Simplified Chinese, Turkish, etc). The screen can be set to refresh after either 1, 3 or 5 page turns. You can bookmark a page, search for a word, or use the table of contents. That's not much in the way of features, I know. But this ereader is still more capable than the txtr beagle, and you won't have to buy a new Android smartphone in order to get it, which is going to be the only way you'll be able to buy the txtr beagle. The Pyrus Mini currently retails for 49 euros. That beats the European price of the Kindle by 30 euros. For a tiny little $65 ereader, it's not bad. It's so light that the weight is almost imperceptible. I've been carrying it around in the same pocket as my cell phone this week, and whenever I have been stuck in line I've pulled it out to read a few pages. The page turn speed is (I think) slightly faster than my Kindle Paperwhite, and that is whatsoever surprising. I expected it to be slower. But this ereader is not perfect. I've noticed that it seems to turn itself off if left along for too long (over night, for example). All in all, this is a better ereader than I expected for the price. If your desire is to carry around a real ereader while still keeping weight to a minimum then this is the gadget for you. 2 Weeks In: This is still a cute little ereader, but over the past couple weeks I've noticed the same couple bugs happening again and again. This ereader likes to turn itself off at random intervals. I've picked it up after letting it sit for as short as half an hour and discovered that it had turned itself off. I have no idea why this is happening, but I can say that I could not find a menu option that would stop the Pyrus Mini from turning itself off. The other bug is a quirk involving the page turn buttons. Sometimes this ereader won't register that you pressed the button, but when you press it a second time it will then turn the page twice. Felix asked in the comments what I thought of the screen. 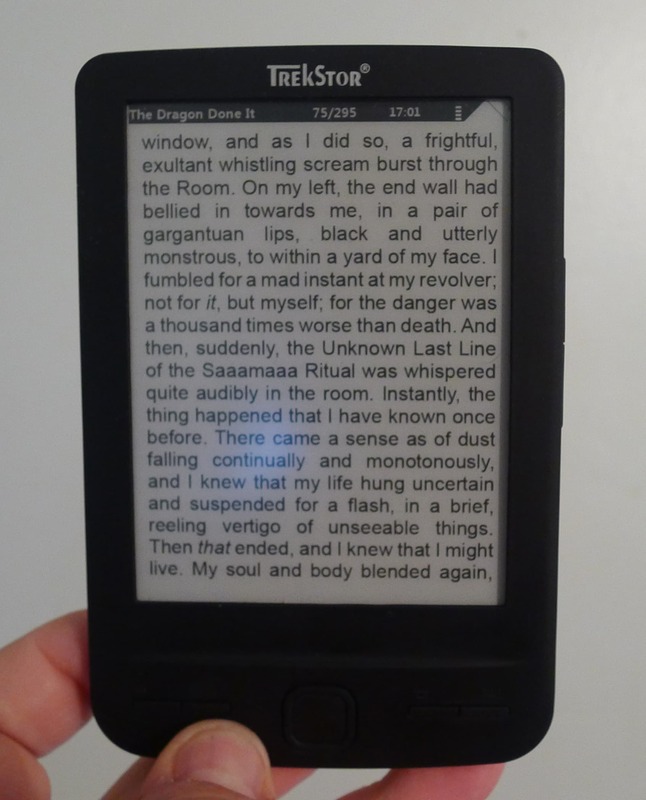 With most ereaders it would not matter, but this ereader doesn't have an E-ink screen. It has a screen which E-ink says is a knockoff. I can't tell with the naked eye whether this is the same screen tech as E-ink's but I do know that when I put it next to a KPW, this ereader has a very slight brown tint to the screen but is otherwise as white as the screen on the KPW. Show a pic with it next to the Kobo Mini. It looks more like a two-finger job, than a one-hander. a very polished video, even if i didn’t understand what you were saying. Online store uses English for the device name, in their logo and the name of the store, but everything else is in German. I guess I will wait. So, how does the screen quality rate? It is supposed to be an unauthorized clone, right? Somebody ought to tell them to put Coolreader on the thing. I compared the Pyrus Mini to the Kobo Mini and KPW, and I think the Pyrus Mini has an ever so slight brown tint to the screen instead of the gray tint in the other screens. But it is a very subtle difference. Now, where can I order one? I assume it’s rechargeable, with micro-USB, rather than the AAA’s that beagle takes? And usually, when something is 50 euro, it’s also 50 dollar… Considering that there’s a tax included in the euro price, which there shouldn’t be in the dollar price. That is very cute, although too small for me. I think something in this form factor might find success in the US if priced for around $50, though. Does it support hierarchical subdirectories? Can I change fonts in all formats, including epub? Can I install custom font? Can you post photos next to Kobo mini and PocketBook 360? I saw a video review somewhere and the screen looked like it had better contrast than eink pearl. It uses something trademarked as ‘Digital Ink’. just brought a pyrus mini (16/7/2013). from koorang bookstores australia. press the next page button and sometimes it skips a page. does it about every 25 pages and is regular glitch. Has frozen twice. no real problem just hit reset but hope it is not ongoing. unit is easy to read, store handle perfect to use anywhere. one thing they could change it has an automatic page turner, gees they must be slow readers the minumin is 1 minute!!! fell asleep first time I used it, since been disabled. I have just bought one pyrus mini in mediamarkt, flensburg, DE. I’m very impressed, I used to have a nook, but sold it after getting a iPad. I have e little problem with the battery life, i only last 1 og 2 days. I have disabled all auto shutdown/standby both was set to 4 hours/15 minuts. Have you experinced anything similary? I suspect I could be sleeping on top of it, pressing a button? I forgot to add, I only payed 29€ it was really a bargain. Well Bjarne, somewhere on the web there is a guy recommending not to disable autostandby but to enable them, because it helps his batterylife. Too expensive. Amazon was just selling its basic Kindle for under $40 for Mother’s Day. What price are you referring to? You’re commenting an article that’s almost one and a half years old. And Amazon doesn’t usually sell its basic Kindle for less than $40. I’m thinking of buying this e reader, but I want to know: can it read scanned pdf ? It has a 4.3″ screen. Reading a scanned PDF on this would be worse than reading one on a smartphone. adorable BUT it seems near impossible to buy one of these on line anymore since it appears to be discontinued. I have a couple, but the screens are dinged up so I don’t think I can sell them. I have had two so far.. I love the pyrus mini – but the screens break by them self – The first one was laying unused for two months on my bed stand and when I finally turned it on (yes it holds charge) it wa “cracked” in the screen, and not remembering when last I had used it, naturally I thought I had broken it.. so I got a new one – with protective case and gorilla glass type screen protection.. then last week I had it on the table before me and remembered it was turned on so I better turn it off – flip the case open and see the top half of the screen is our of focus and half brightness – so I turn it off and on, and then the top half right side, is just not on..
Now I’m completly lost at what to do, when the screens crack all by them self – cuz I love this little ebook reader, so small with buttons..